1. Ski Time With Other Moms at Women and Wine Friday Afternoon Club. With Women and Wine FAC, you get the perfect combination of skiing and après skiing. From 12:45-3:45 p.m., you and up to two other women will get a private ski lesson led by a female instructor from the Vail Ski & Snowboard School. In these lessons women can learn or brush up on their ski skills in a small group setting, from the foundation-building basics of a first-timer class, to navigating the easiest greens, to sharing tactics and camaraderie on the resort’s beginner and intermediate trails. Finish the day with a glass of wine at Express Lift at the base of Gondola One. You’ll head home just in time to spend your Friday evening relaxing with the family. Dates: Every Friday from Dec. 15 through March 31 (terrain-dependent; dates subject to change). This season, Vail is also introducing new women’s-specific monthly workshops, which provide women with the exclusive opportunity to fine-tune their skills with a ski and snowboard school pro while making new female friends. Vail Resorts Retail will also provide females with the most current gear while on their guided tour. The full-day and half-day workshops will be offered on Dec. 19, Jan. 9, Feb. 20 and March 5. 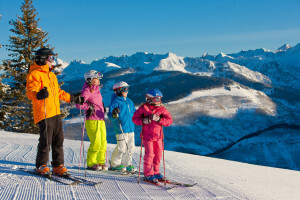 Explore the mountain together as a family with the guidance of your own personal instructor. You’ll learn from one of our world-renowned pros that will guide you around the mountain, share local knowledge and ensure that you access the lifts more quickly. Book a full day or half-day lesson and share in each other’s learning as you progress together. Book your Private Family Ski Lesson. 3. 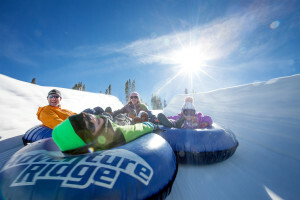 Take the Kids Tubing at Adventure Ridge. Play in the afternoon and well into the night at Adventure Ridge with ski bikes, kids snowmobile track, a slippery slope of rip-roaring tubing lanes and more. Take the whole family for a thrill ride followed by dinner at Bistro Fourteen ($10 kids menu daily). The easy-access surface lift will send you up the mountain like a magic carpet ride, dropping you at the top of one of the most over-the-top tubing experiences. The multi-lane tubing hill will whisk you downhill, leaving you and the whole family breathless and ready for more. You can book one-hour sessions on the hour and half-hour! Drink hot chocolate and watch the sun set over Vail’s legendary back bowls. Adventure Ridge offers a family experience Like Nothing on Earth. 4. 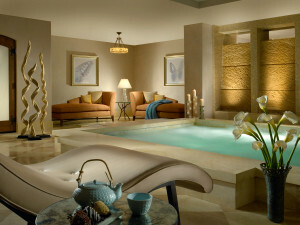 Relax at the Spa While the Kids Take a Lesson. Let’s face it – moms deserve to be pampered. As it turns out, Lionshead ski and ride school starts at 10am and is conveniently located right next to the world-renowned RockResorts Spa at The Arrabelle at Vail Square. The Arrabelle at Vail Square is open to outside guests, so even if you aren’t staying in one of Vail’s premier properties, you can still enjoy the luxury (and you should)! 5. Enjoy World-Class Shopping and Events. Who says you can’t find adventure off the mountain as well? Between Vail Village and Lionshead village, you can browse and shop in hundreds of stores and galleries. Find the perfect cowboy boots, ski boots, jewelry, high-end apparel, artwork, accessories, souvenirs and cocktail dresses while strolling the heated cobblestone streets. If you’re feeling chilly, stop in to Gorsuch to warm up with a glass of complimentary hot cider or pop into The Tavern for a bite and a glass of wine.